Spark!Lab is a hands-on invention activity center where visitors learn that invention is a process and that everyone is inventive. Activities incorporate history, science, engineering, technology, and art. A visit to Spark!Lab “sparks” imagination and curiosity, and can be the first step to exploring our own inventiveness and invention in the world around us. Spark!Lab opened at the National Museum of American History in 2008 and was one of its most popular attractions until it closed in 2012 in preparation for the renovation of the Museum’s west wing. The success of Spark!Lab led the Lemelson Center to establish the Spark!Lab National Network in 2011. The Network is an active community of museum professionals who foster inventive creativity in families in their own neighborhoods. 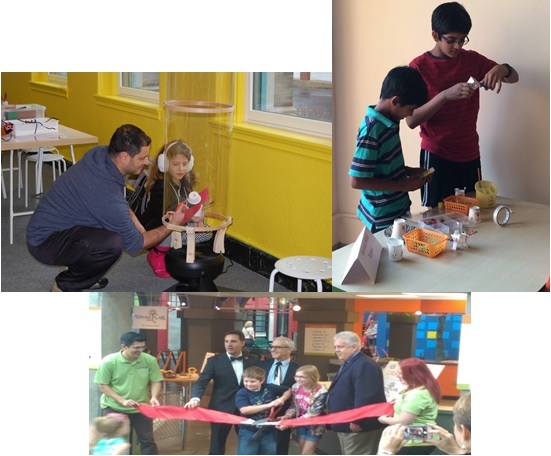 The first Spark!Lab off of the National Mall opened at the Terry Lee Wells Nevada Discovery Museum in Reno, NV, in 2011. A generous donation from the Ford Motor Company Fund is expanding the Network to three additional US sites. Internationally, the Lemelson Center shared the Spark!Lab experience with visitors to Art Arsenale in Kyiv, Ukraine, during a temporary installation in 2012. Spark!Lab operated in Gurgaon, India, in 2014. Left: Lemelson Deputy Director Jeff Brodie (center) gives remarks at the opening of Spark!Lab at Art Arsenale in Kyiv, Ukraine. He is accompanied by the Director of Art Arsenale (right) and a translator. Photo courtesy of the US Department of State. Father and daughter test their prototype in the wind tunnel at Spark!Lab Berkshire Museum; boys build prototypes at Spark!Lab India, and officials open Spark!Lab at Science City in Kansas City. Photos by Kate Wiley and Tricia Edwards. To request further information on how you can bring Spark!Lab to your community, contact Tricia Edwards, Head of Education at EdwardsT@si.edu.